Never get confused by the tone curve again! The tone curve looks scary – But once you learn to master this Lightroom develop tool you’ll be miles ahead in your photo editing. Today we’re going to look at what the tone curve is for, how to use the tone curve, and adding effects such as filmic fade and split toning. Don’t let the tone curve intimidate you! Learn how to use the Tone Curve In Lightroom and unlock a ton of powerful editing features in this comprehensive Lightroom Tutorial. 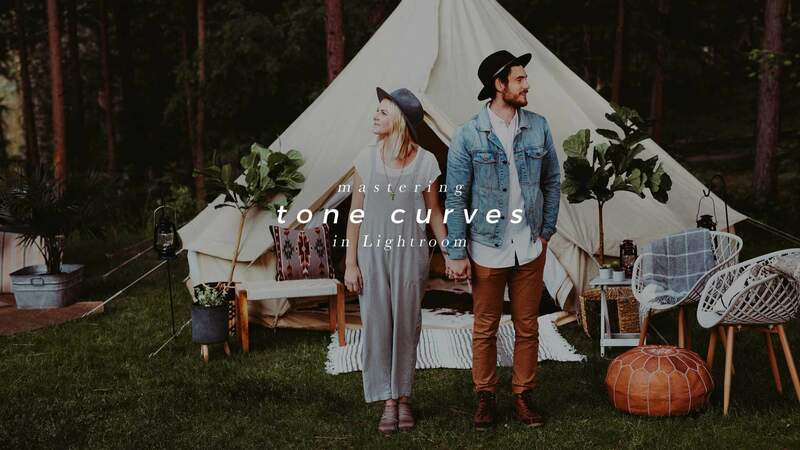 The tone curve is an essential part of Lightroom – And with a few quick tricks you’ll be ready to edit better photos and never get confused by the tone curve again. Why use the Tone Curve instead of just adding contrast etc with the basic editing panel in Lightroom? 1) The tone curve allows for SELECTIVE contrast. With the contrast slider you have one set way to add contrast – Its either on or off. With the tone curve, you can add contrast in a specific portion of your image without affecting other portions – add more contrast in JUST the highlights, or JUST the midtones etc. 2) The tone curve RGB panel lets you control the levels of blacks and whites to reduce contrast. The contrast slider only allows you to ADD contrast. 3) The tone curve lets you set custom black points and white point, allowing you to add a filmic feel to your images and dial in the exact amount of fade you want. 4) The red, green and blue portions of the tone curve allow you to do all of this with SPECIFIC color channels – Which means you can tweak color balance in your image, add / remove tones in specific areas (darken greens in JUST the shadows for instance) – Whereas the hsl panel luminance only lets you darken / brighten the greens as a whole. Overall the reason to use the tone curve instead of other more basic tools in Lightroom is for more control & targeted adjustments. There are a LOT of things you can do with the tone curve – Many of which can’t be done anywhere else in Lightroom!